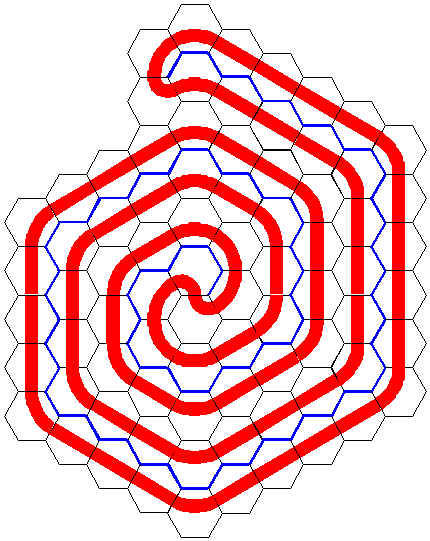 The best strategy for solving these puzzles seems to be to find a loop of the specific colour without trying to match the other colours, and then to rearrange tiles as necessary to satisfy the first rule. This gives an easier problem to solve, one which is more amenable to analysis. Some results for this problem are presented below. The bend and corner tiles contribute 60° or 120° of “turning”, respectively, but the sense of this turning depends on whether they are convex or concave with respect to the interior of a loop. It can be seen that e = 2 - t in all cases. The number of internal edges can conveniently be used to label these five tile configurations as T0, T1, T2, T3, and T4. Let N be the number of tiles in a loop, T the total turning, and E the total number of internal edges (counting each shared edge once only). 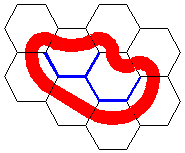 Then 2E = 2N - T, since each edge is shared between two tiles. It is clear that the total turning must be 360°, so T = 6, and E = N - 3. 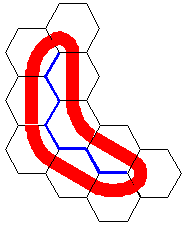 Because of the second rule, the internal edges must form a connected tree, without loops. Except for the shortest loop N = 3, which has E = 0, the internal edges provide a “skeleton” of a loop, from which the arrangement of tiles can unambiguously be deduced. When there is no branching, the skeleton zig-zags between two endpoints, with any number of bends in between. Each occurrence of a 3-way junction introduces a branching and an additional endpoint. Loops can be classified by the number of endpoints, P. Each endpoint corresponds to a T0 tile. The number of T2 tiles is not shown, as the rule E = N - 3 can be satisfied regardless of the number of straights. When there are two endpoints, solutions can be found with any number of straights, or with none. 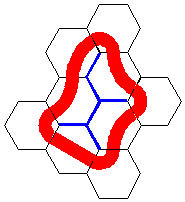 When there are three or more endpoints, however, the interaction of tiles is more complicated, and a certain number of straights may be needed for a solution. These ideas can be used to solve some puzzles from the Tantrix puzzle page.